Thanks for all your help in making this (project) happen. I really do appreciate the service. You really do go the distance for your customers. 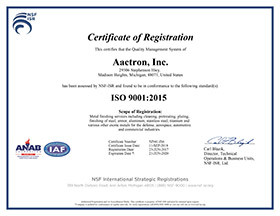 We have been working with Aactron for many years and we can recommend them as a friendly and responsible company to work with. They try very hard to understand our unique needs. I have been working with Aactron for the past 8 years and they have been an amazing partner for all my coating needs.